Let’s get back to the main reason I went to the 2013 North American International Auto Show in Detroit. 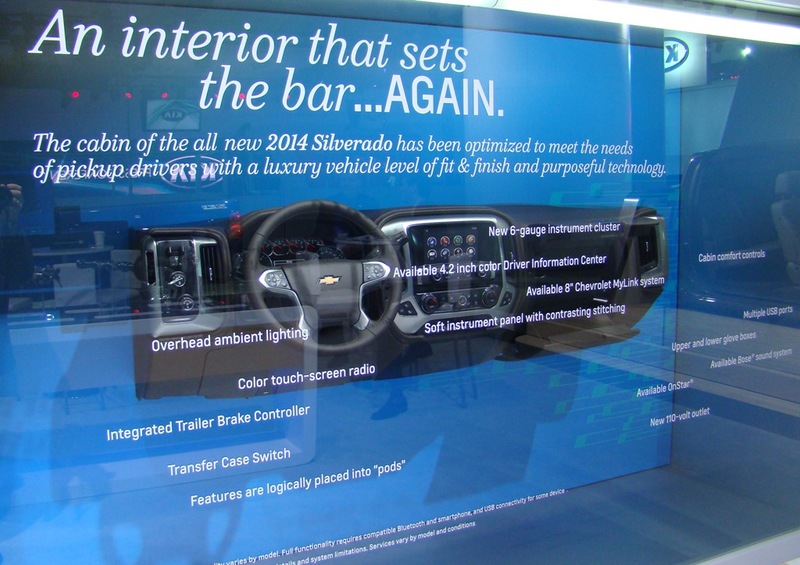 General Motors invited me to NAIAS to look at their completely redesigned 2014 Chevy Silverado and GMC Sierra 1/2 ton trucks. On the second and third days of the show I had an opportunity to interview some key GM personnel about the redesigned 1/2 ton truck line-up, and to take an up close and personal look into what to expect for 2014. As many of you know I drive a Dodge, but I was really impressed with what GM is doing with it’s trucks and across the board as an auto maker. A good place to start is under the hood. The new 1/2 ton truck line-up will come with 3 engine options. All 3 versions are the all-new Eco Tec3 engines. One thing I was really impressed with was GM incorporated many of the same features found in the new Corvette engine into their truck engines. 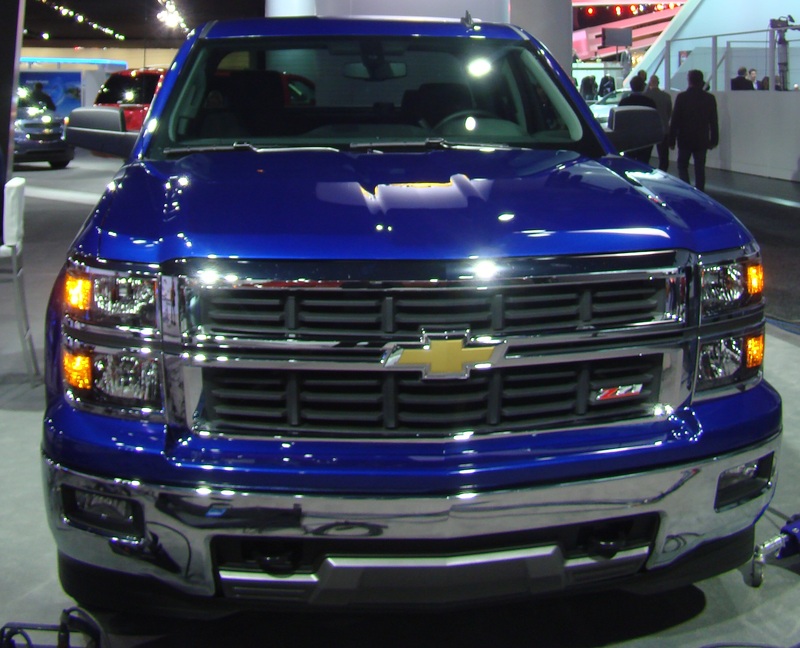 The 2014 Silverado and Sierra will come available with options for a 4.3L V-6, 5.3L V-8 or 6.2L V-8. 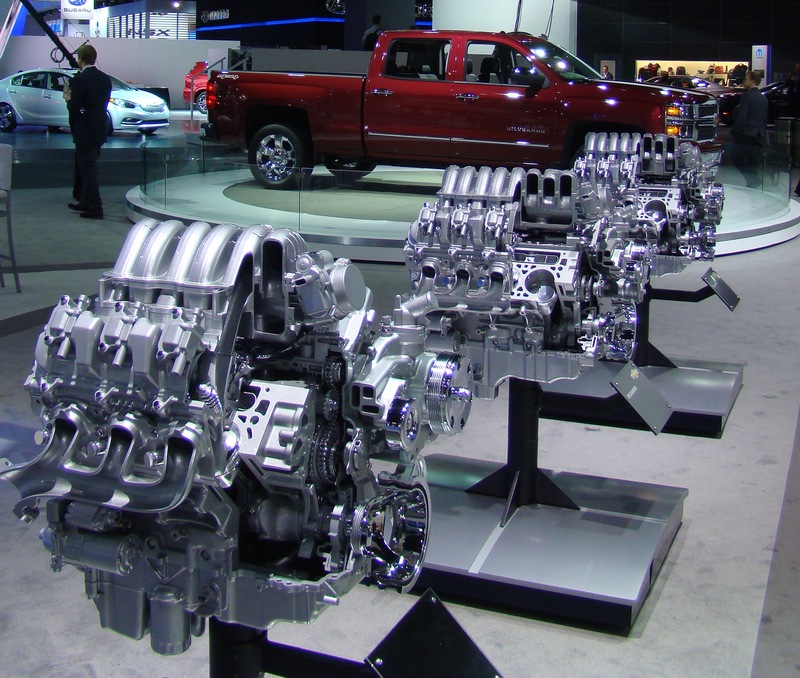 These engines were designed by GM specifically for use in full-size trucks. All 3 Eco Tec3 engines come with direct fuel injection, continuously variable valve timing (VVT) and cylinder deactivation. So, not only does power and performance promise to be strong for the new truck buyer, but fuel economy is significantly improved too. I thought it was a great idea to still offer the more powerful V-8 powerplants, but incorporate the cylinder deactivation to run the engine on 4-cylinders when you don’t need all that extra power. During my interview with the Chief GM Engineer for Small Block Engines I tried to get the new horsepower and torque ratings, but GM wasn’t ready to release that information yet. He did however promise me I would not be disappointed at all. As we are all aware, automakers are being pressed hard by the new federal CAFE fuel standards and regulations being imposed over the next decade. To help increase the truck’s fuel economy GM didn’t stop with engine cylinder deactivation. 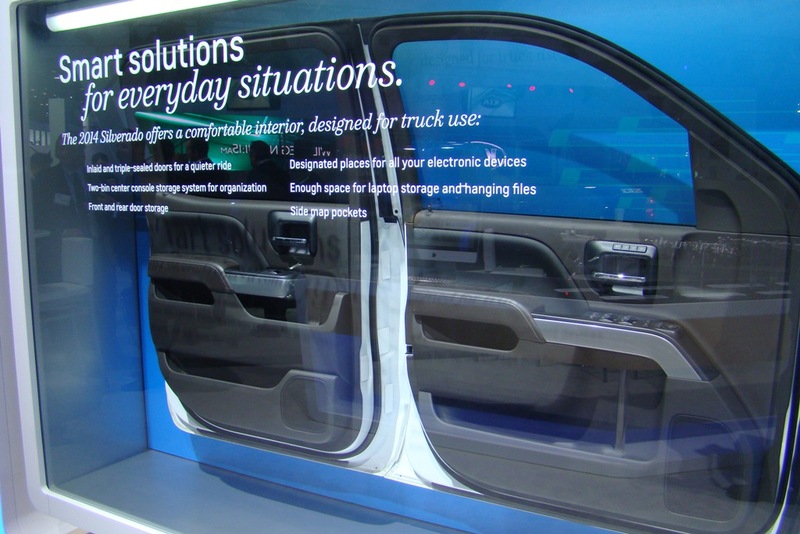 All areas of the newly designed truck’s were addressed to help improve fuel economy. The new front end was engineered to improve sealing, which in turn increaseses cooling efficiency. The truck went through extensive wind tunnel testing to improve airflow and reduce drag over the top and around the sides of the truck. These modifications include a new air dam located on the lower front portion of the truck below the bumper, and aerodynamic roof and tailgate engineering . 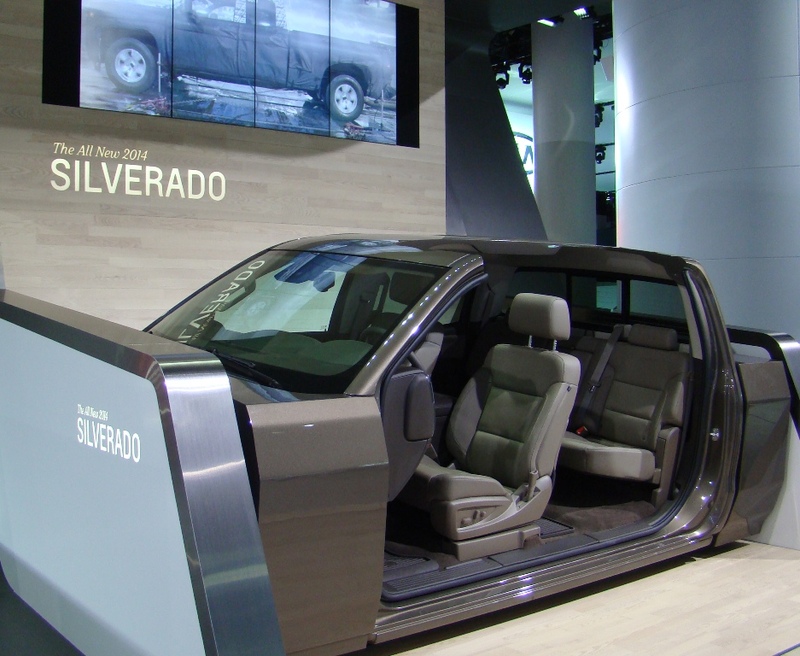 GM even added a seal between the cab and the truck’s bed to assist with more efficient airflow, and upgraded the steering with all-electric variable assist power steering. Not only does the truck handle better, but without the engine driven steering pump it helps increase fuel economy. Under the truck GM upgraded the main frame rails and crossmembers with high-strength steel, and the use of hydroforming contributes to improved strength as well. All 3 engines are bolted to a 6-speed transmission with ratios and shift schedules completely optimized for performance and fuel efficiency. For those of you interested in towing with the new Silverado and Sierra the transmission features Auto Grade Braking to help slow the truck down on downgrades and helps reduce brake wear. With increased torque from the new V-8 engines GM opted for larger 9 1/2 or 9 3/4 inch rear axles in the powertrain. Four-wheel disc brakes with corrosion resistant Duralife brake rotors were added into the mix as standard equipment to double the brake rotor’s life expectancy and reduce brake pad wear. The truck’s exterior was completely redesigned for 2014. In addition to some fuel improving exterior designs I mentioned a moment ago GM updated the aesthetic appeal of the truck too. They wanted that strong powerful look truck owner’s have grown accustomed too, but at the same time make it more refined. Starting at the front of the truck the first thing you notice is the twin port grille and stacked headlights on the all-new Silverado. Upgraded models come equipped with a honeycomb style grill as well. Along the sides of the truck you immediately notice the bold fender flares and the new inlaid doors designed to improve the looks and reduce wind noise in the cab for a quieter ride. GM added an optional 6 1/2′ bed on 2014 Crew Cab models for an extra foot of hauling capacity without going to a longer 8′ bed. The 5″8″ short bed remains in the line-up too. 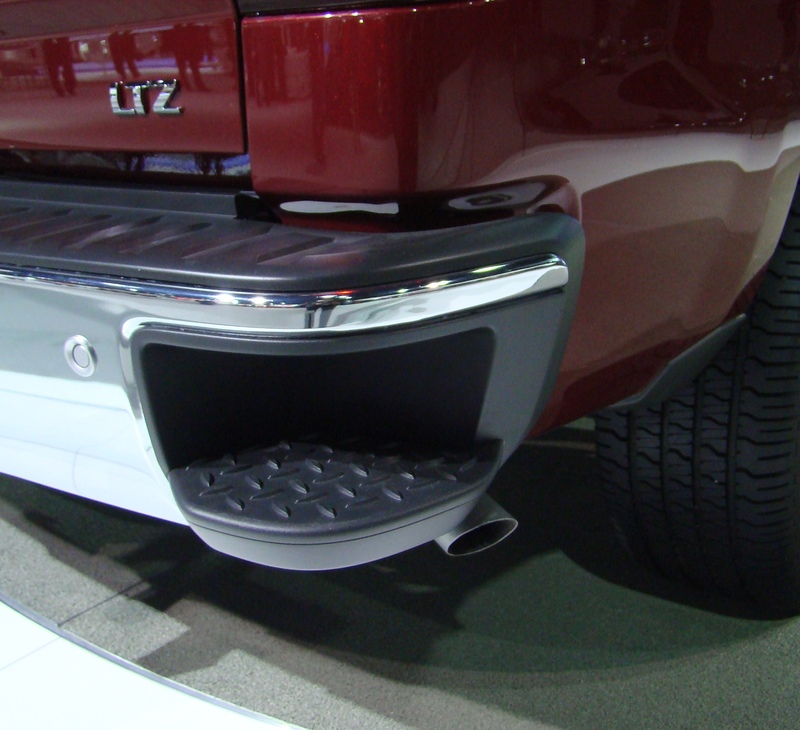 The new available EZ lift and lower tailgate makes the job of lowering and closing the tailgate a snap. 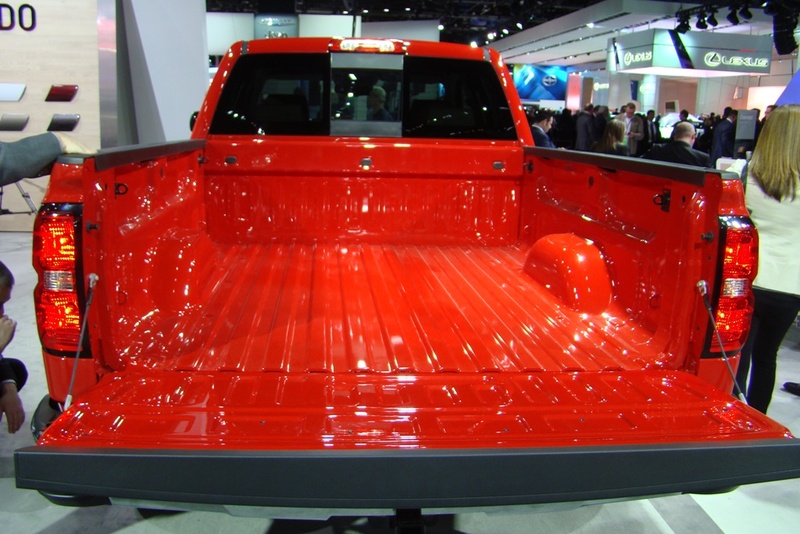 The truck box is made from rolled-steel as opposed to stamped beds for added strength, and the trucks feature new LED taillights. Other features I liked on the all-new truck box include under-rail LED lighting that works off a switch in the cab, upper and lower bed tie-down hooks and a cornerstep rear bumper large enough to accomodate a work boot. If the exterior and running gear didn’t sell you on the all-new 2014 GM trucks the interior just might. These trucks look like a trruck but ride like a luxury automobile. The interior is loaded with features to provide a quiter ride, like triple door seals, use of sound-absorbing materials and on the 6.2L V-8 active noise cancellation technology. Crew cab trucks account for more than 2/3s of light-duty truck sales in the automobile industry and GM took notice. The door pillars were moved forward to allow for more leg room in the back seating area and the truck is quieter, roomier and more comfortable than ever before. The instrument panel looked sharp with a 6-gauge instrument cluster front and center for easy viewing. Most of the truck models are equipped with a 4.2 inch display for the driver information center and all controls proved to be large, easy to read and easy to operate. The available MyLink infotainment system is easy you understand and use and can accomodate linking up to 10 devices. Voice recognition lets you keep your hands on the wheel when you place calls, search for a destination, play your favorite music or control other interior functions. And don’t forget about GMs ONSTAR syetem for ease of diagnostics, navigation, roadside assistance and other emergency services. Interior storage starts with large pocket door panels, a top and bottom opening glove box and a center floor console large enough to store your hanging file folders. The seats are extremely comfortable yet long lastings and easy to clean with new high wear fabric. Don’t forget about safety features, GM sure didn’t! Earlier I mentioned that nearly 2/3s of the cab and frame were built with high strength steel. This all contributes to occupant safety in the event of a crash. GM also incorporated safety features like Foward Collision Alert (FCA) to warn of a possible collision, Lane Departure Warning (LDW) if you start to wander into another lane without using your turn signal. Both warning systems provide visual alerts and an option to choose from additional audible signals or in-seat vibrations. One of the big reasons I wanted to attend the NAIAS was to find out what is new in the world of towing for the 2014 GM 1/2 ton trucks. I was pleasantly surprised with some towing features in the new trucks, but was disappointed that GM chose not to use the new SAE J2807 Towing Standards to determine tow ratings for their 2013 truck line-up. They did go as far as testing the trucks using SAE J2807, but at the last minute pulled the SAE ratings since other truck makers opted out of the new testing criteria until they bring their new truck line-up to market. Who knows when that will be? Hopefully the 2014 models will all comply with the agreed on testing. Hill Start Assist that holds the brakes for up to 1.5 seconds, or until the accelerator is pressed, to prevent rollback. Hill Decent Control that uses antilock braking to provide a controlled grade decent without constant use of the brake pedal. 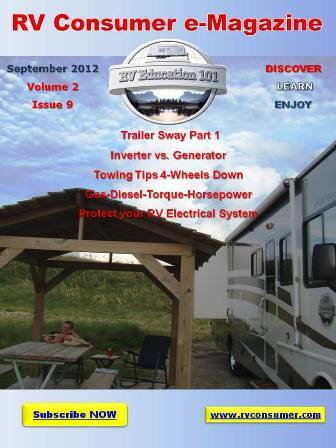 Tow/Haul mode to give you additional power to accelerate when towing a trailer. Built-In Trailer Brake Controller conveniently located to the left side of the steering wheel. The 2014 Silverado continues to offer StabiliTrak electronic stability control. All 6-speed automatic transmissions used with the Eco Tec3 engines also feature Auto Grade Braking, which helps slow the truck when going down a grade, resulting in less brake wear and potential brake fade. 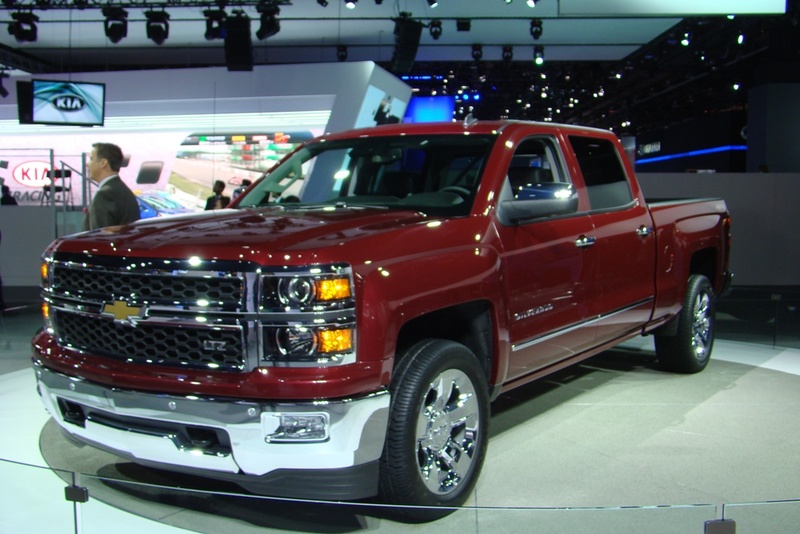 I thoroughly enjoyed attending NAIAS and would like to thank GM for the opportunity, but I did not let the invitation influence the way I perceived the all-new 2014 GM 1/2 ton trucks. These are fine trucks with lots of advanced technology incorporated throughout. My hat goes off to GM and I look forward to when they release the Eco Tec3 HP and torque ratings for the new engines. If you are contemplating a new truck in your future all I can say is you may want to wait until these trucks hit dealers lots before you buy. You may be pleasantly surprised, just like I was. 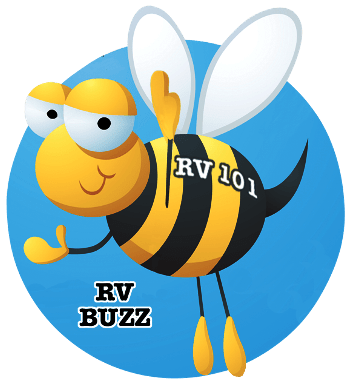 Don’t miss the February issue of RV Consumer Magazine when we feature some interviews and highlight the future of trucks as it peratins to the RV industry. If you don’t already subscribe to the magazine sign up here.